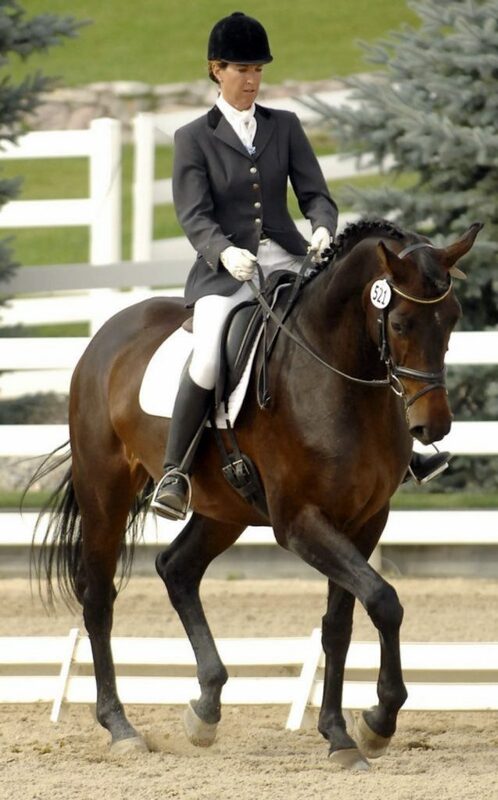 Editor’s Note: 2018 & 2019 Best Horse Practices Summit presenter Katrin Silva grew up riding dressage in Germany before moving to the United States at age 19 to learn to ride Western. She’s been riding both disciplines for the last twenty years and is a regular guest columnist for Cayuse Communications. She lives in New Mexico where she works with dressage and Western clients. 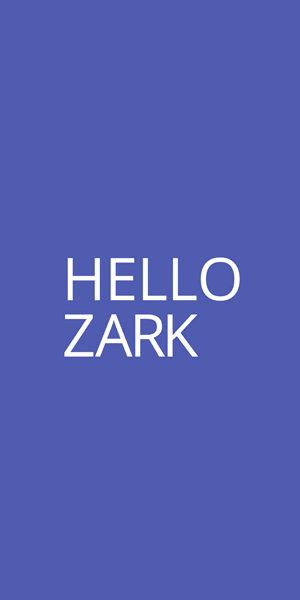 Visit her blog here. I spent last weekend at the Chamisa Classic in Albuquerque. Three days later, I still feel utterly exhausted. Why? On Friday, we packed up saddles, feed, tack room furniture, the kitchen sink, etc. 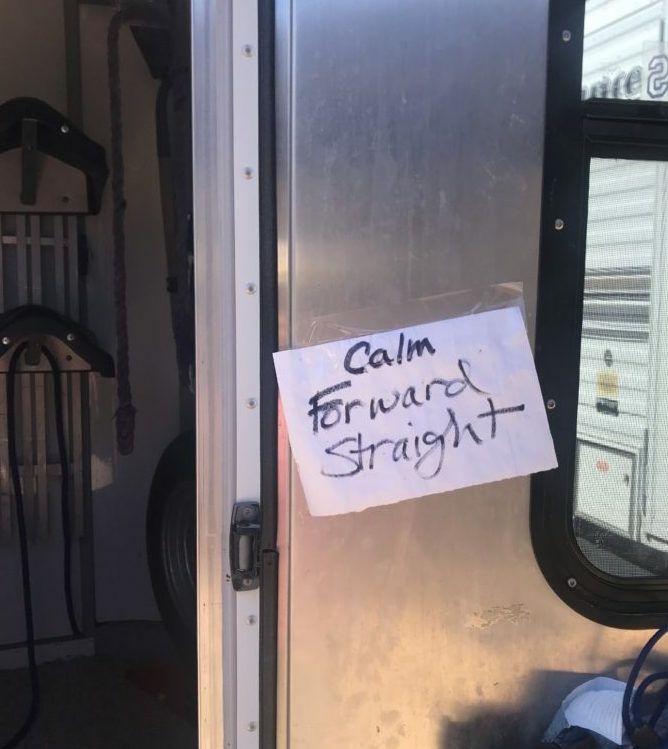 We loaded four horses, hauled to the Albuquerque fairgrounds, unloaded, lunged and rode everyone, tried to get the horses as clean as possible in freezing temperatures, tried to get our tack as clean as possible, dined on canned soup, crawled into our sleeping bags in the camper, and fell asleep studying dressage tests. On Saturday, we fed at 6 am, then went through silly ritual of grooming and saddling horses while trying to keep white breeches and white saddle pads from becoming brown and covered in horse hair. I coached two students through their dressage tests, rode two classical dressage tests, changed from tall boots into running shoes, ran three horses on the triangle for sport horse in-hand, changed into jeans, chaps, and cowboy hat, rode a couple of Western dressage tests, and picked up my score sheets. We then packed up everything, loaded the horses, and made it back to the barn by 8 pm, unloaded everyone and everything, and went home. Horse shows drain my emotions and finances. Showing pushes me way out of my comfort zone, sometimes into a place where I feel like the world’s worst rider, like I should find a different line of work altogether. But these moments of despair have become less frequent than they used to be. 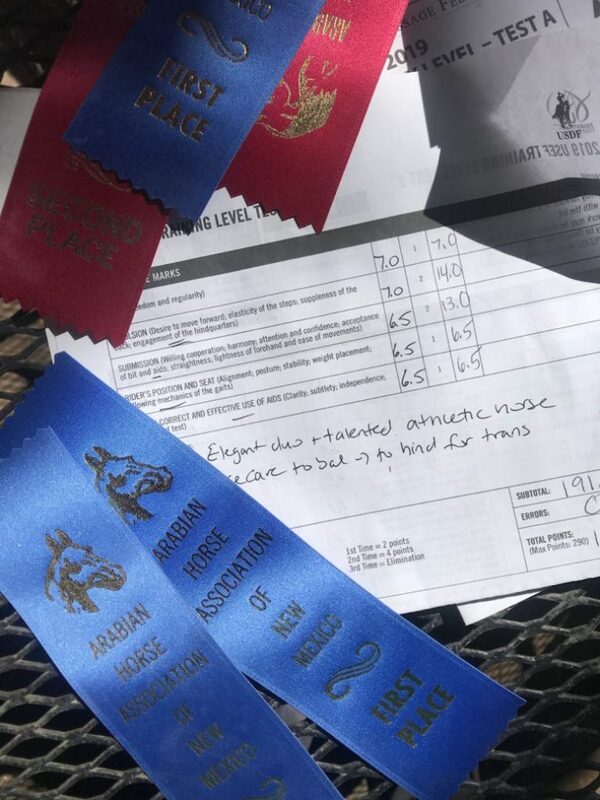 I know that ribbons and scores don’t define my worth as a trainer. I mostly work with horses who are not born and bred to be show horses – rescued horses, horses with behavioral issues, off the track thoroughbreds, etc. My clients value what I teach their horses, without the added feedback from a judge who does not know about the obstacles the horse has overcome. I know that judges can only evaluate what they see in front of them and that they are humans, with biases and imperfections just like the rest of us. In spite of all my struggles with showing, I still want to do it. Not every weekend, but on a regular basis. Shows are synonymous with noise, distractions, and unfamiliar circumstances, like passing water trucks and blaring loudspeakers. Once a horse has learned to focus at home, it’s time to expand his comfort zone beyond the boundaries of a familiar arena. Trail rides and trail obstacles are important, but so is going to new and scary places, like the fairgrounds. I find that horses come back from a show weekend more trusting, more confident, more focused. It helps them grow up in a way other experiences cannot. It would be easy to get comfortable in my little bubble of supportive, appreciative clients. It would be easy to fool myself into believing I know more than I really do, or ride better than I really do. Shows don’t allow for illusions of grandeur. They are reality checks. Shows expose me to criticism, to being judged, to watching very accomplished riders. Shows may be sobering and remind me that I still have a lot to learn and can’t afford to become complacent. My clients aren’t wealthy, but they’re proud of their horses, and of what I’ve done with their horses. Showing is a way of recognizing how far we’ve come as a team. 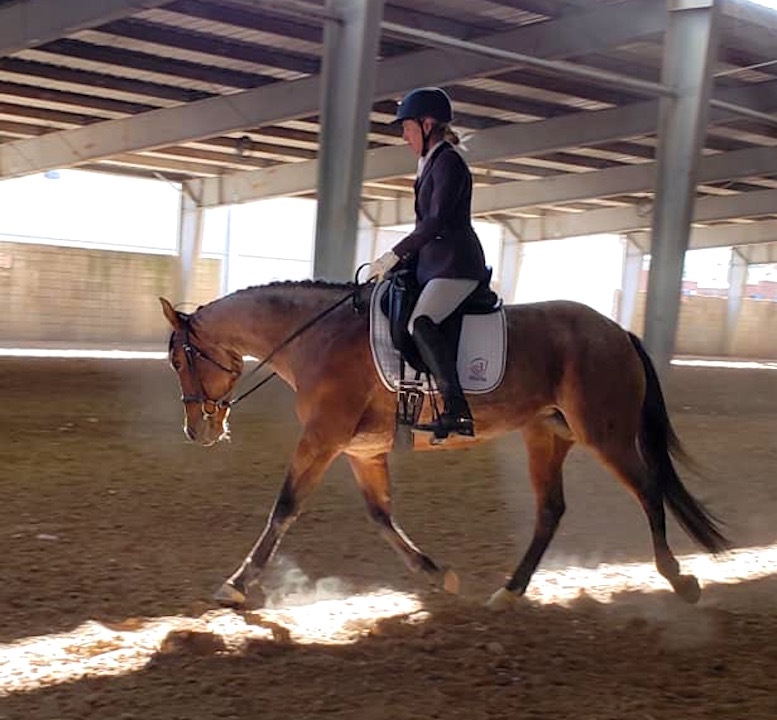 The judge may not know where my horses started, or how amazing it is that we’ve made it to the show ring at all, but their owners do know, which in turn makes me happy. At the end of the day, shows help build a sense of community. We show on a shoestring budget, which means that my students work as hard as I do. Everyone helps everyone else in any way possible. We all muck stalls, braid manes, polish each other’s boots, read each other’s tests. I love seeing my students practice what they’ve learned. I love watching them warm up their horses with patience and focus, to use the toolbox of skills we’ve worked so hard to assemble. I love that we’re able to enjoy some success without compromising the principles of good horsemanship that my program is based on. I love that we’re building horse-rider teams, without shortcuts, one step at a time. And I love that we all support each other in our efforts to become better horse-rider teams. At this stage in my life as a horse trainer, blue ribbons don’t mean what they used to and shows do not define who I am. I train horses for deeper, less tangible, but ultimately much more valid reasons than the thrill of winning. Posted in Horsemen & Women, Reflections, Training and tagged competition, dressage, katrin silva.